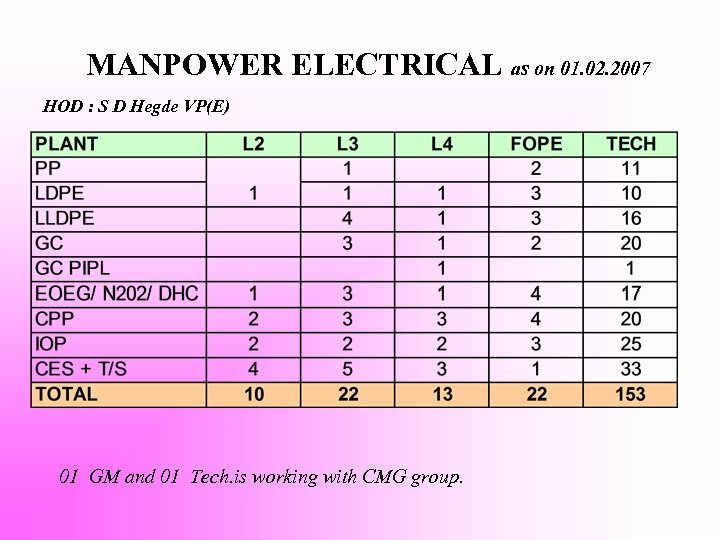 MANPOWER ELECTRICAL as on 01. 02. 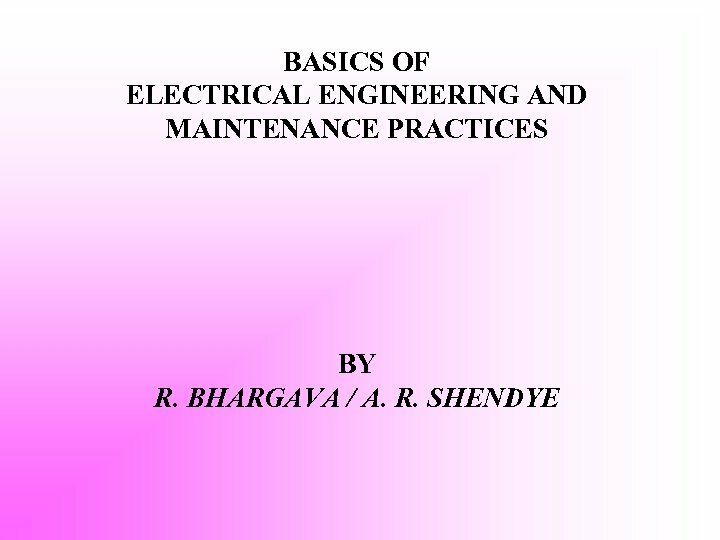 2007 HOD : S D Hegde VP(E) 01 GM and 01 Tech. 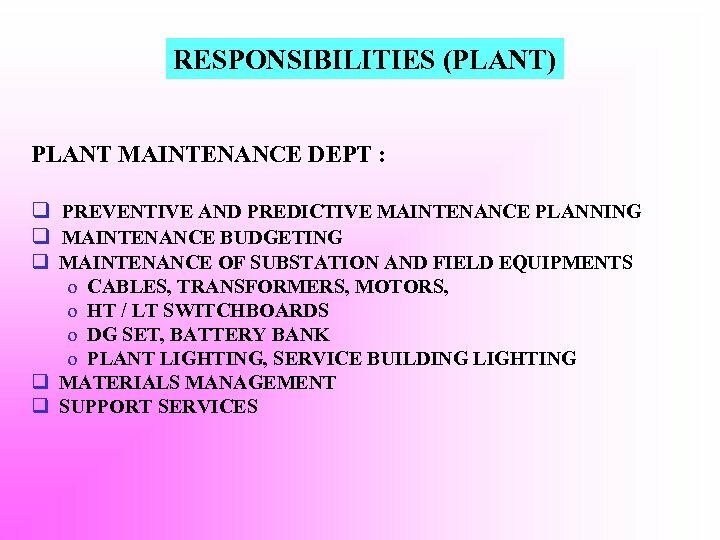 is working with CMG group. 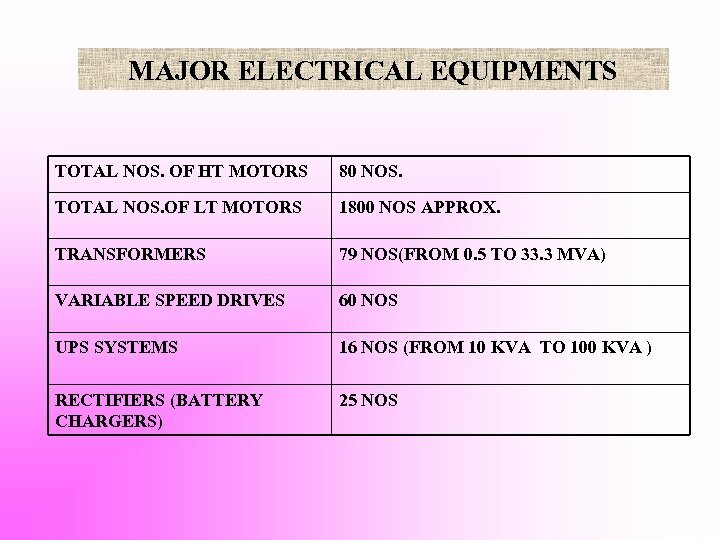 ELECTRICAL POWER SYSTEM ] There are 14 nos. 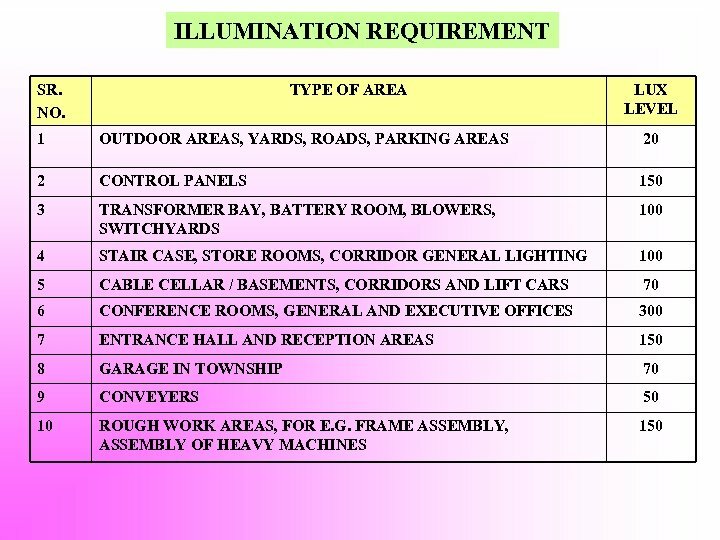 of Electrical Substations (Including T/S) having 11 k. V, 6. 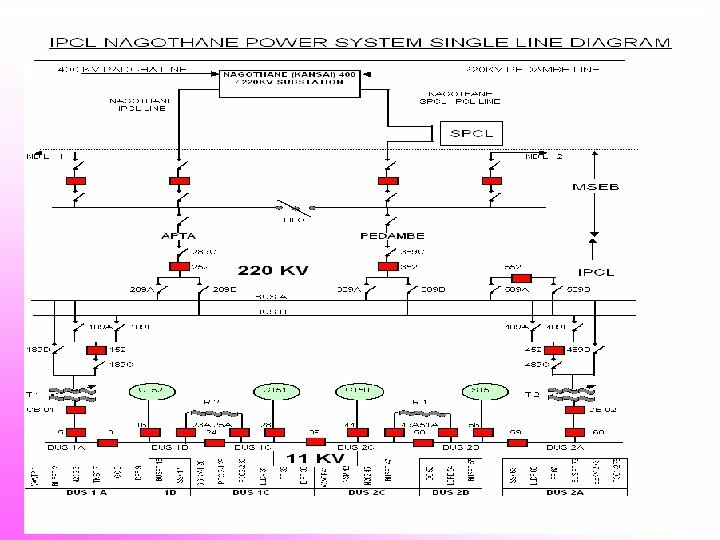 6 k. V, 415 v, 3Ø, 50 Hz supply system feeding to various loads. ] 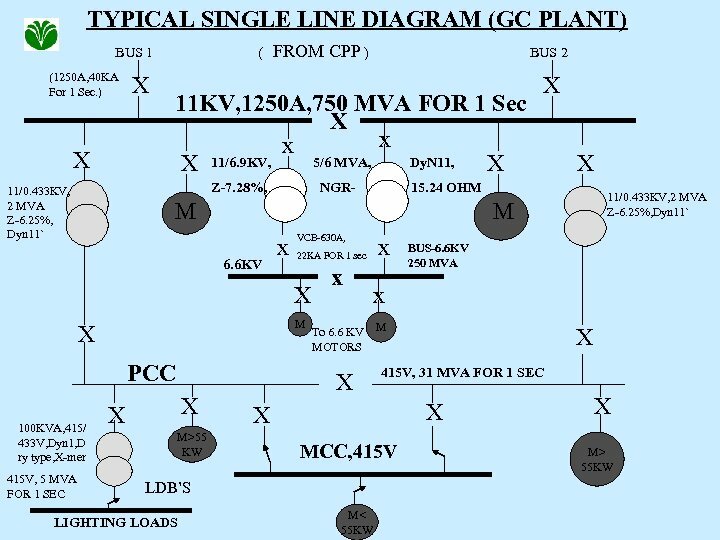 These substations are supplied with redundant 11 k. V supply as Incomer-1 and Incomer-2 from CPP. ] 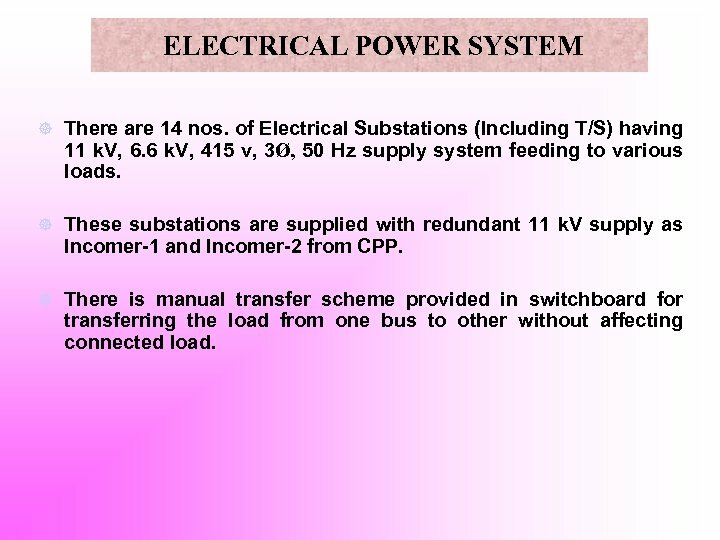 There is manual transfer scheme provided in switchboard for transferring the load from one bus to other without affecting connected load. 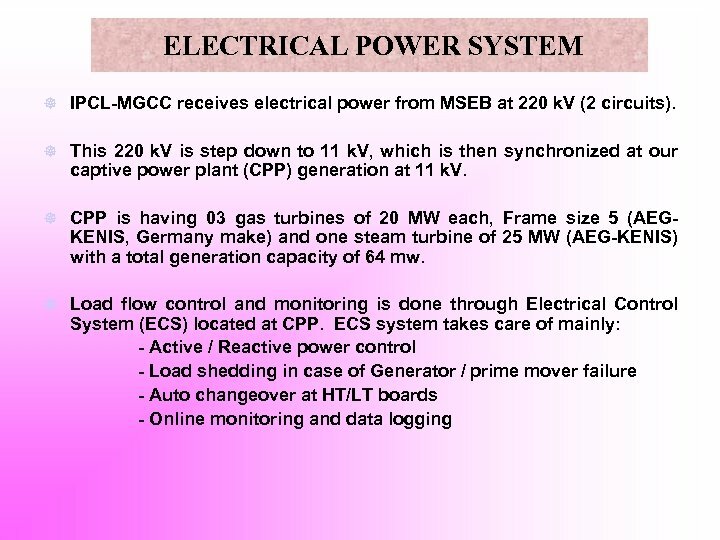 ELECTRICAL POWER SYSTEM ] Motors above 160 k. W are fed through either 6. 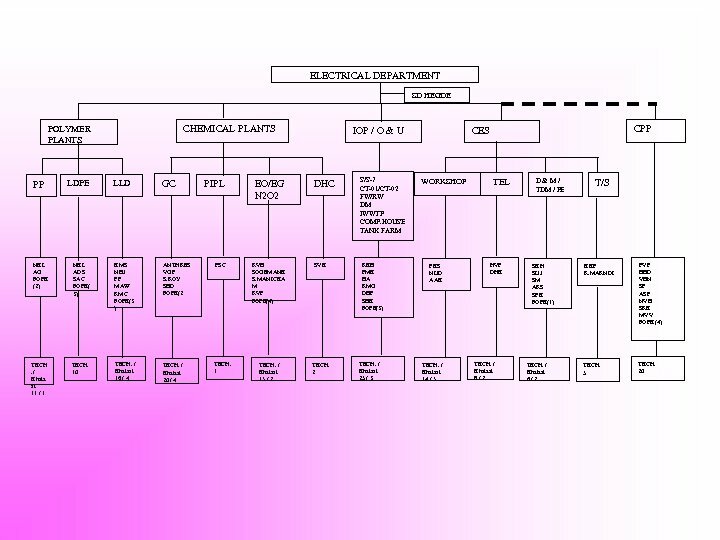 6 k. V or 11 k. V switchboard. ] 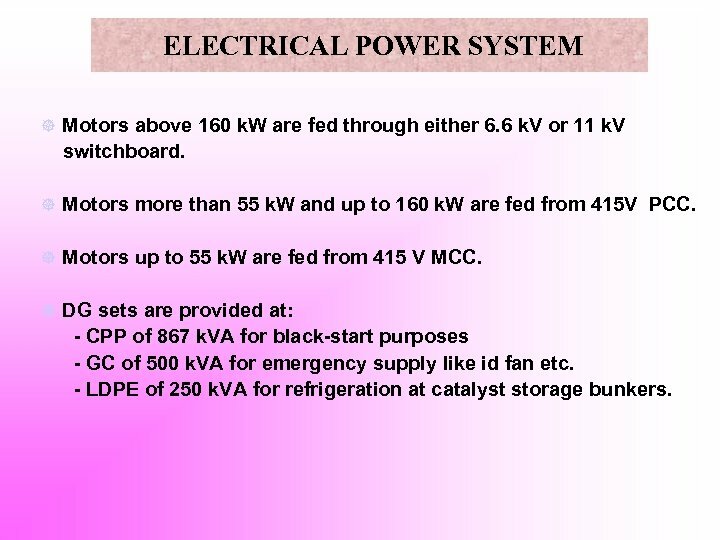 Motors more than 55 k. W and up to 160 k. W are fed from 415 V PCC. ] Motors up to 55 k. W are fed from 415 V MCC. ] 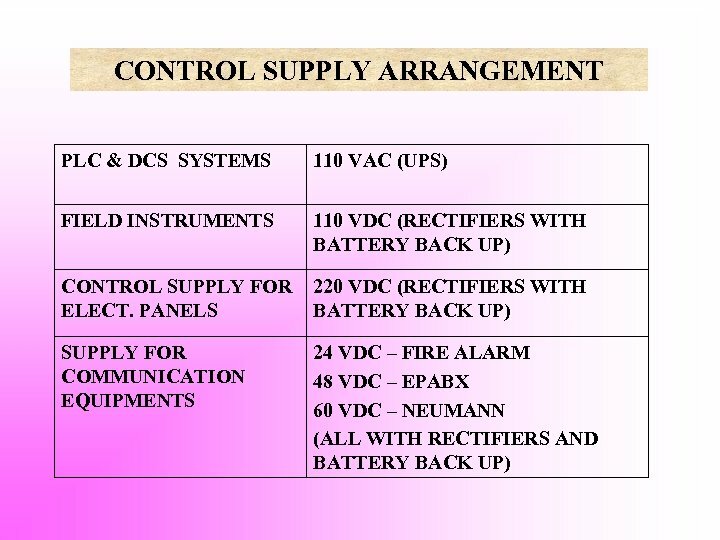 DG sets are provided at: - CPP of 867 k. VA for black-start purposes - GC of 500 k. VA for emergency supply like id fan etc. - LDPE of 250 k. VA for refrigeration at catalyst storage bunkers. 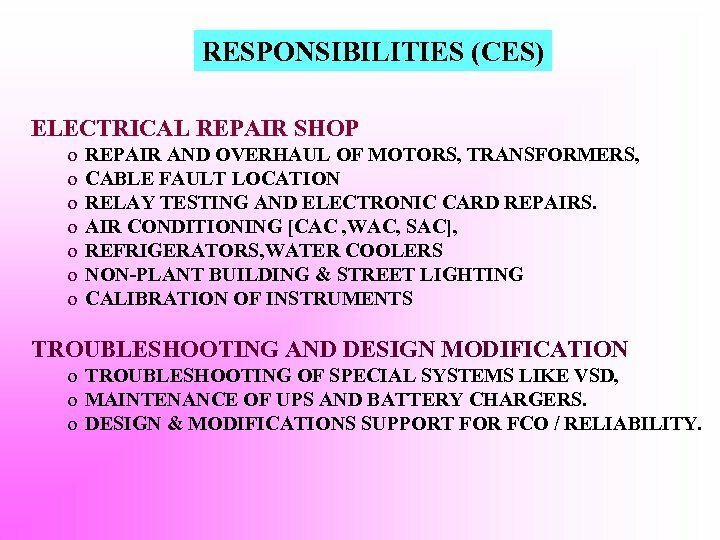 RESPONSIBILITIES (CES) ELECTRICAL REPAIR SHOP o o o o REPAIR AND OVERHAUL OF MOTORS, TRANSFORMERS, CABLE FAULT LOCATION RELAY TESTING AND ELECTRONIC CARD REPAIRS. 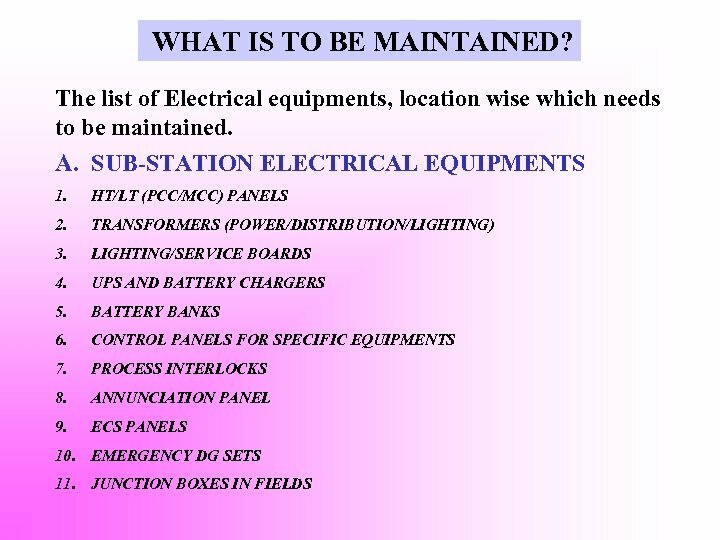 AIR CONDITIONING [CAC , WAC, SAC], REFRIGERATORS, WATER COOLERS NON-PLANT BUILDING & STREET LIGHTING CALIBRATION OF INSTRUMENTS TROUBLESHOOTING AND DESIGN MODIFICATION o TROUBLESHOOTING OF SPECIAL SYSTEMS LIKE VSD, o MAINTENANCE OF UPS AND BATTERY CHARGERS. 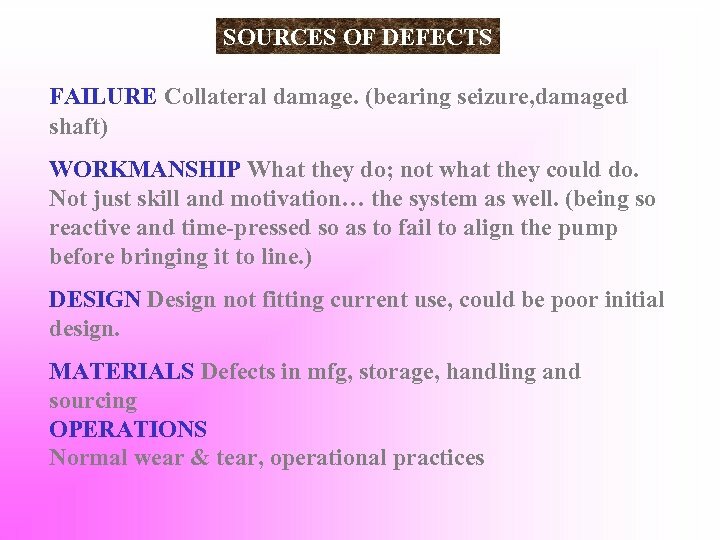 o DESIGN & MODIFICATIONS SUPPORT FOR FCO / RELIABILITY. 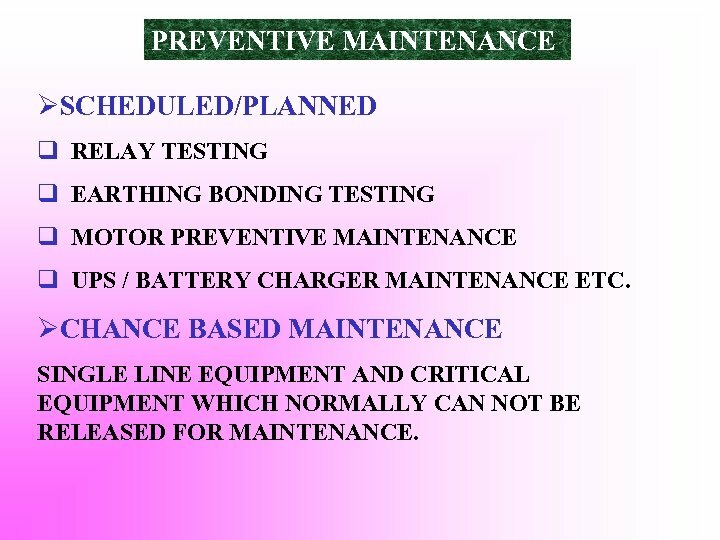 TYPES OF MAINTENANCE PREVENTIVE MAINTENANCE CONSISTS OF PERFORMING REGULAR MAINTENANCE ON A TIME SCHEDULE. IT IS AN EXPENSIVE ALTERNATIVE THAT SIMPLY MASKS AND DELAYS THE ROOT CAUSES OF FAILURE. 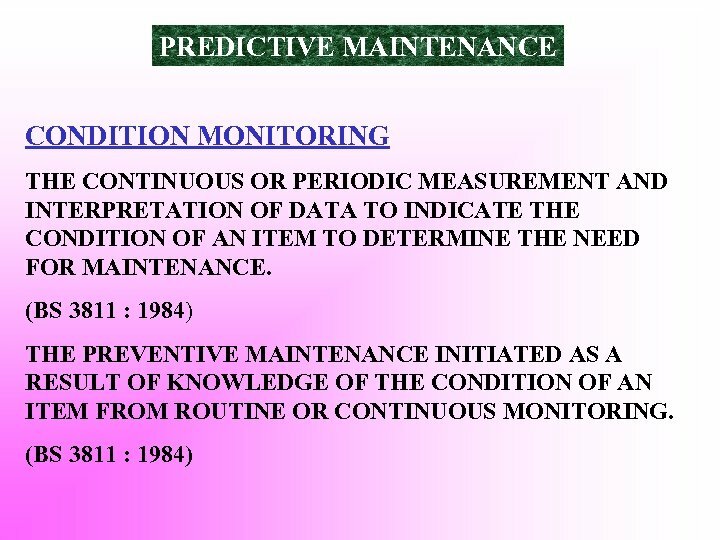 PREDICTIVE MAINTENANCE CONSISTS OF APPLYING EARLY WARNING TECHNIQUES TO DETECT SMALL AMOUNT OF DAMAGE BEFORE THEY LEAD TO CATASTROPHIC FAILURE. EXPENSIVE REPAIRS REMAIN IMMINENT. 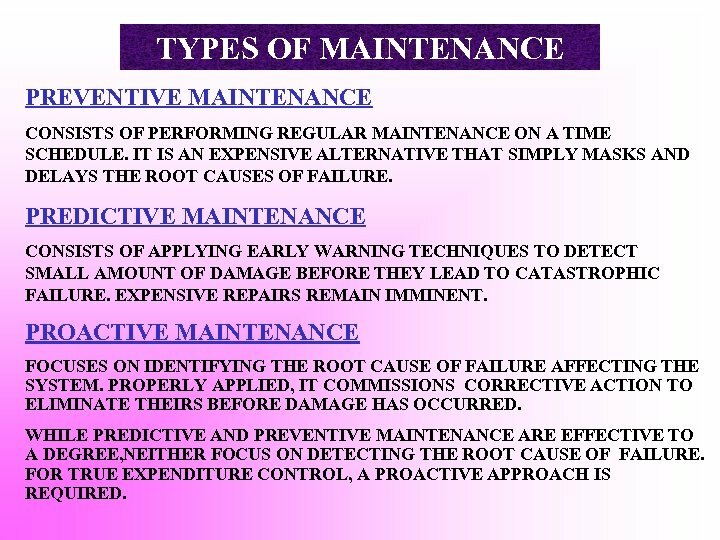 PROACTIVE MAINTENANCE FOCUSES ON IDENTIFYING THE ROOT CAUSE OF FAILURE AFFECTING THE SYSTEM. 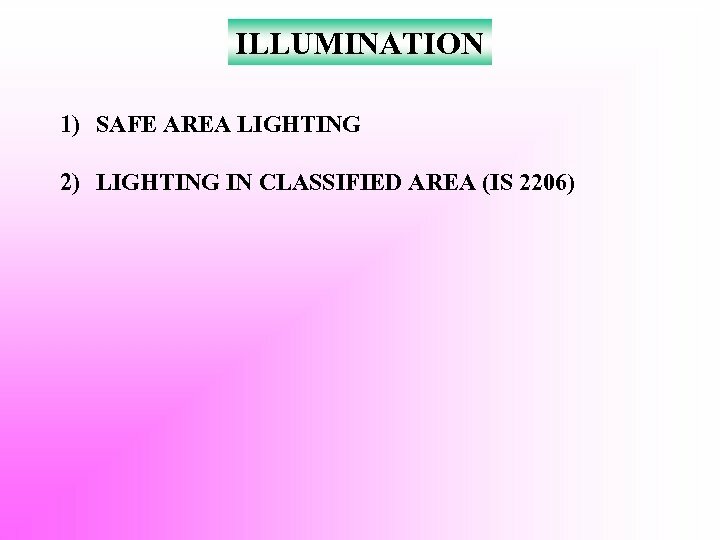 PROPERLY APPLIED, IT COMMISSIONS CORRECTIVE ACTION TO ELIMINATE THEIRS BEFORE DAMAGE HAS OCCURRED. 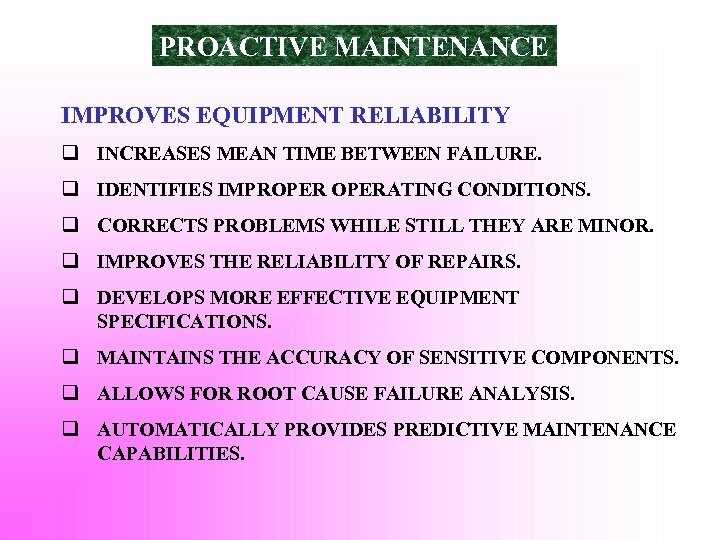 WHILE PREDICTIVE AND PREVENTIVE MAINTENANCE ARE EFFECTIVE TO A DEGREE, NEITHER FOCUS ON DETECTING THE ROOT CAUSE OF FAILURE. 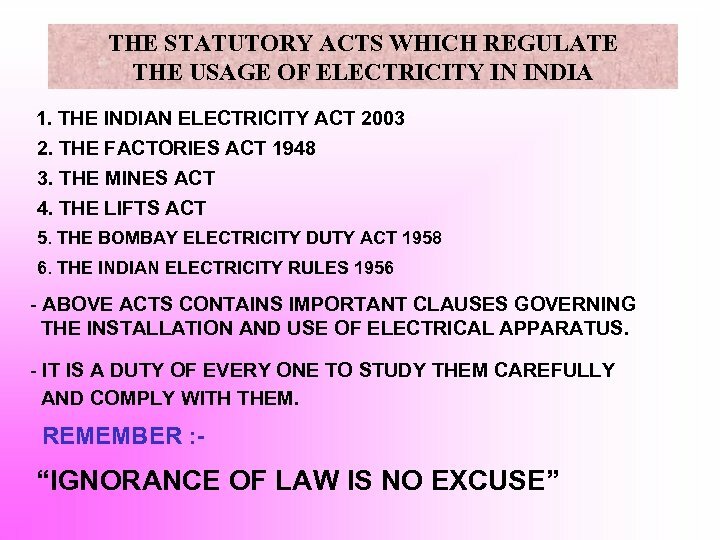 FOR TRUE EXPENDITURE CONTROL, A PROACTIVE APPROACH IS REQUIRED. 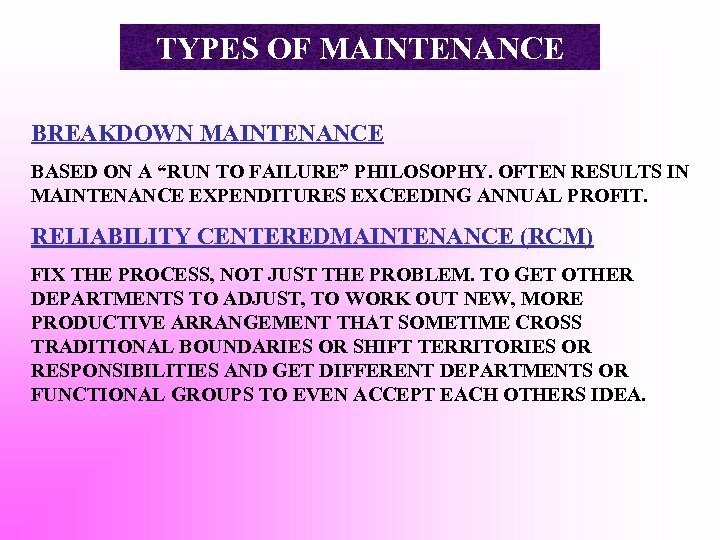 TYPES OF MAINTENANCE BREAKDOWN MAINTENANCE BASED ON A “RUN TO FAILURE” PHILOSOPHY. 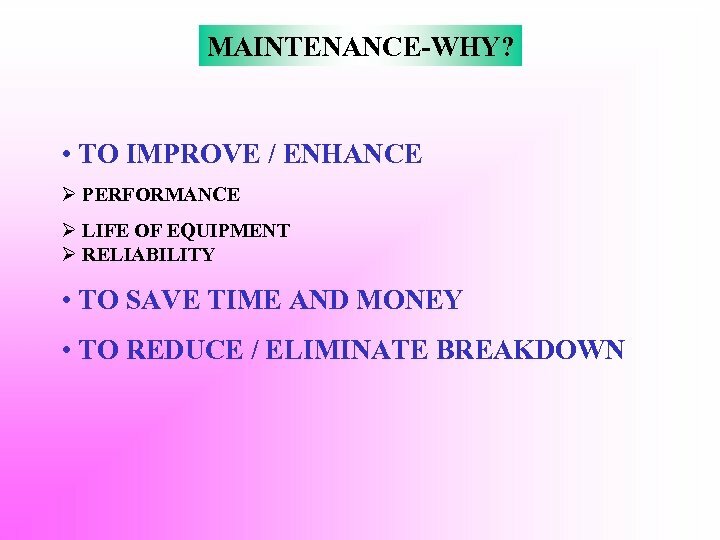 OFTEN RESULTS IN MAINTENANCE EXPENDITURES EXCEEDING ANNUAL PROFIT. 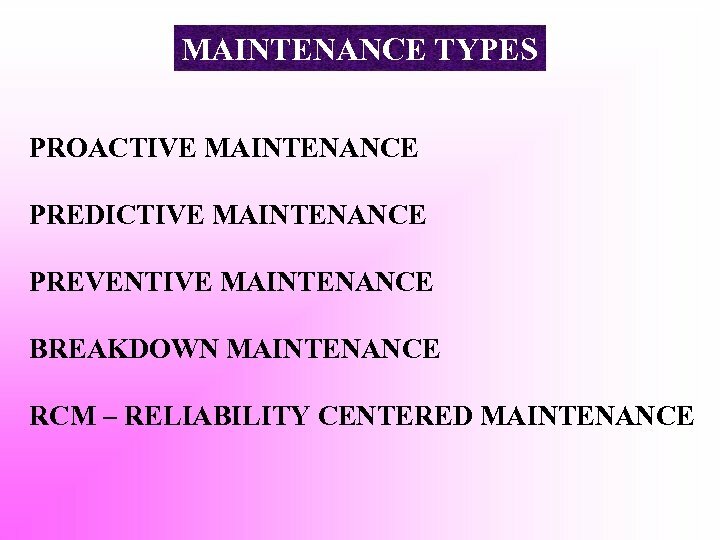 RELIABILITY CENTEREDMAINTENANCE (RCM) FIX THE PROCESS, NOT JUST THE PROBLEM. 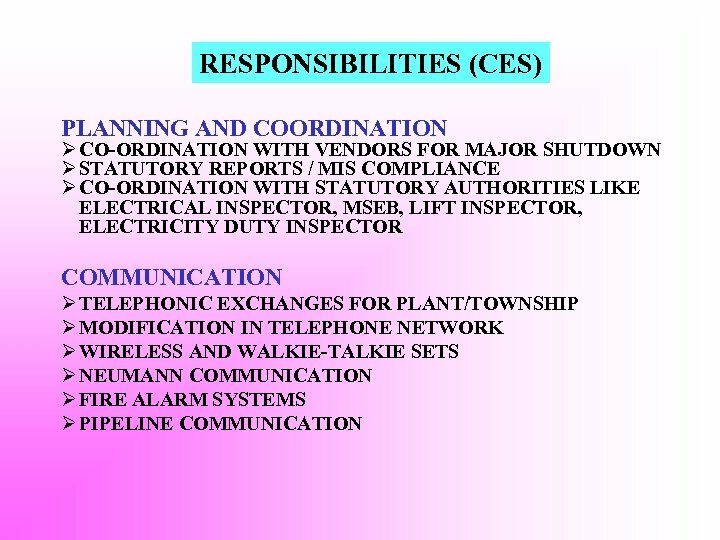 TO GET OTHER DEPARTMENTS TO ADJUST, TO WORK OUT NEW, MORE PRODUCTIVE ARRANGEMENT THAT SOMETIME CROSS TRADITIONAL BOUNDARIES OR SHIFT TERRITORIES OR RESPONSIBILITIES AND GET DIFFERENT DEPARTMENTS OR FUNCTIONAL GROUPS TO EVEN ACCEPT EACH OTHERS IDEA. 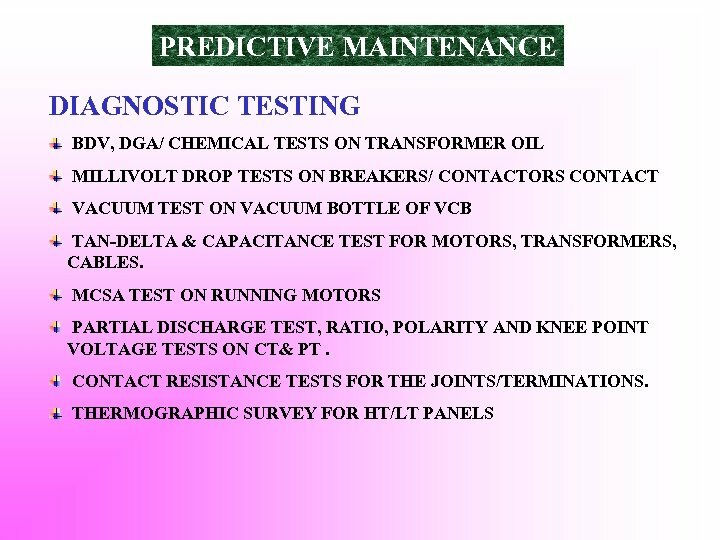 PREVENTIVE MAINTENANCE ØSCHEDULED/PLANNED q RELAY TESTING q EARTHING BONDING TESTING q MOTOR PREVENTIVE MAINTENANCE q UPS / BATTERY CHARGER MAINTENANCE ETC. 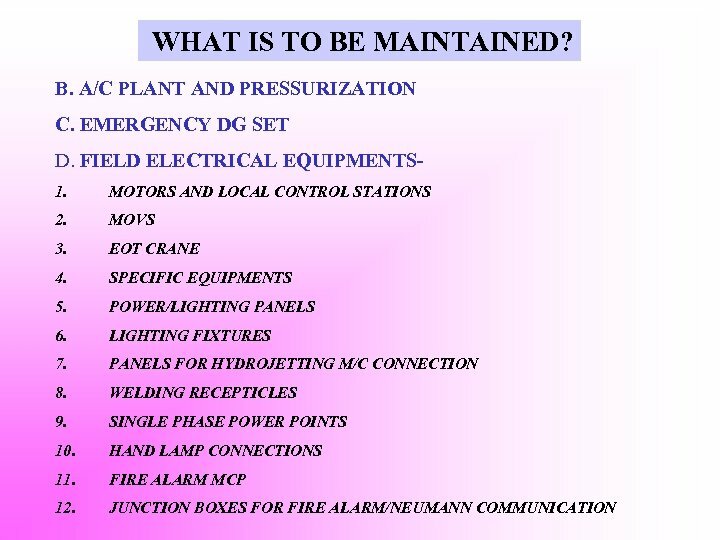 ØCHANCE BASED MAINTENANCE SINGLE LINE EQUIPMENT AND CRITICAL EQUIPMENT WHICH NORMALLY CAN NOT BE RELEASED FOR MAINTENANCE. 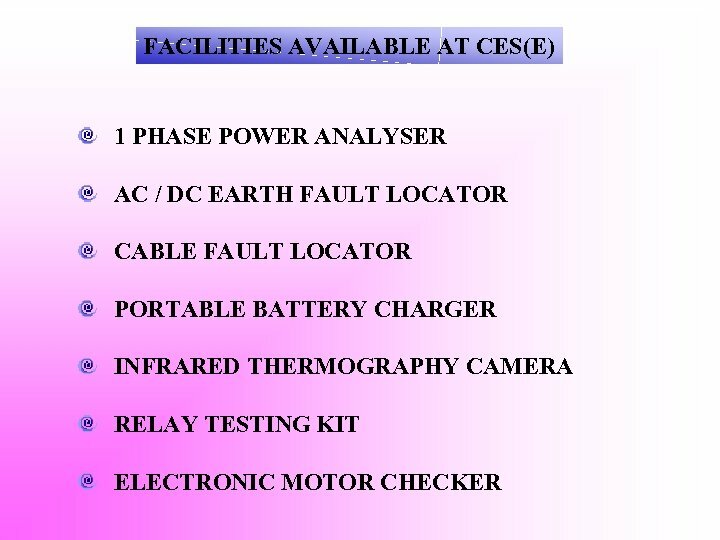 PREDICTIVE MAINTENANCE CHANCE BASED MAINTENANCE RELAY TESTING EARTHING / BONDING CHECKING PANEL MAINTENANCE TRANSFORMER OVERHAULING/ PREVENTIVE MAINTENANCE OVERHAULING / PM OF CRITICAL MOTORS AND SINGLE LINE EQUIPMENT BATTERY BANK MAINTENANCE UPS AND BATTERY CHARGER MAINTENANCE OF COMMUNICATION SYSTEM ETC. 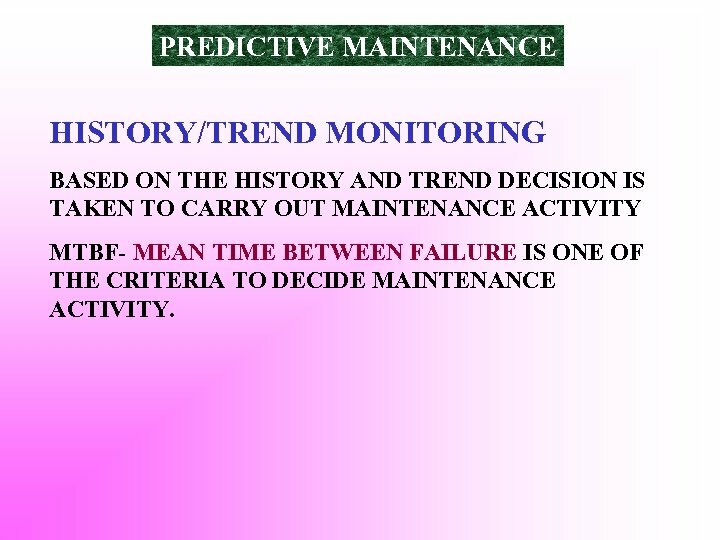 PREDICTIVE MAINTENANCE HISTORY/TREND MONITORING BASED ON THE HISTORY AND TREND DECISION IS TAKEN TO CARRY OUT MAINTENANCE ACTIVITY MTBF- MEAN TIME BETWEEN FAILURE IS ONE OF THE CRITERIA TO DECIDE MAINTENANCE ACTIVITY. 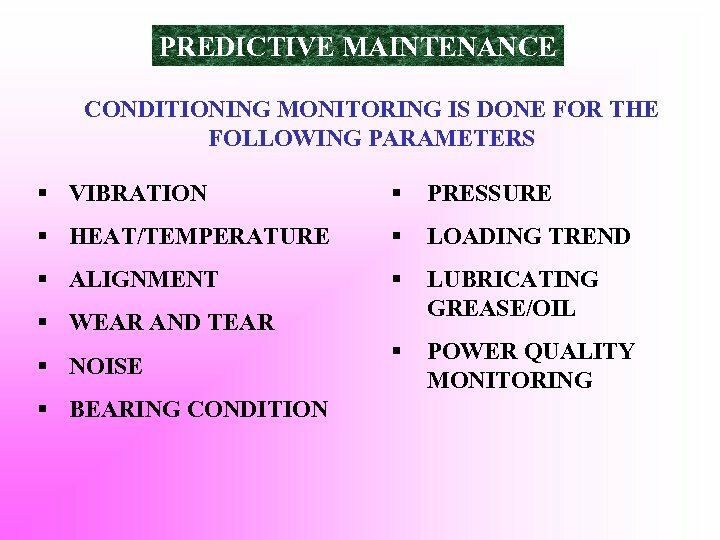 PROACTIVE MAINTENANCE IMPROVES EQUIPMENT RELIABILITY q INCREASES MEAN TIME BETWEEN FAILURE. q IDENTIFIES IMPROPERATING CONDITIONS. q CORRECTS PROBLEMS WHILE STILL THEY ARE MINOR. q IMPROVES THE RELIABILITY OF REPAIRS. 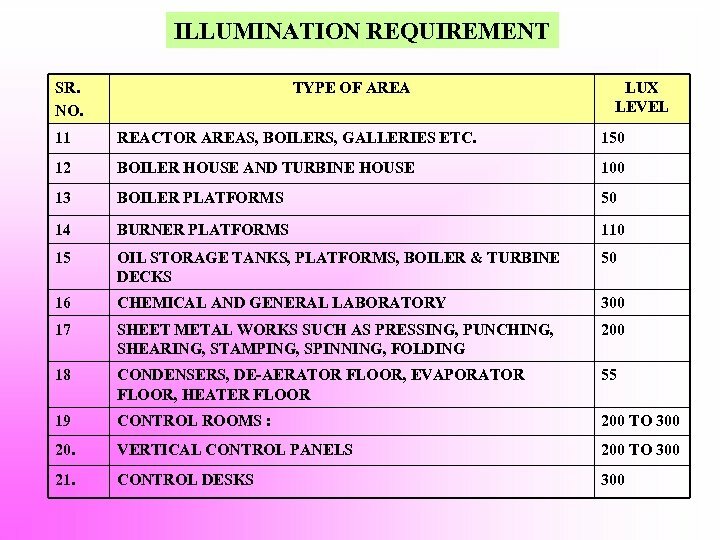 q DEVELOPS MORE EFFECTIVE EQUIPMENT SPECIFICATIONS. 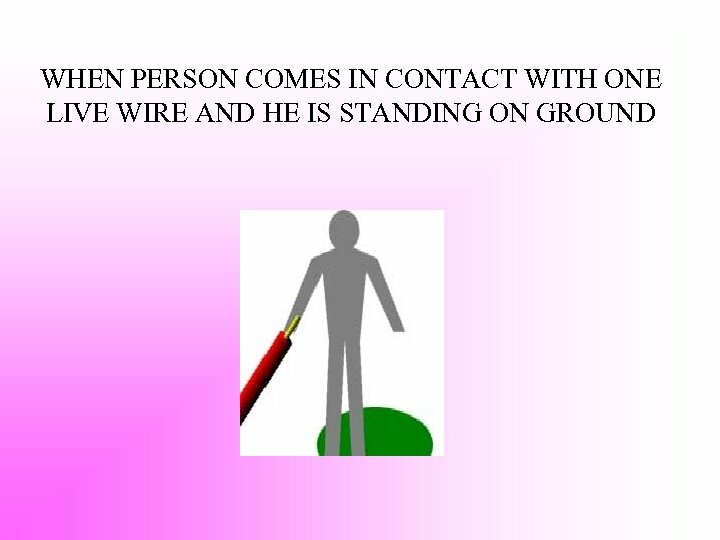 q MAINTAINS THE ACCURACY OF SENSITIVE COMPONENTS. q ALLOWS FOR ROOT CAUSE FAILURE ANALYSIS. 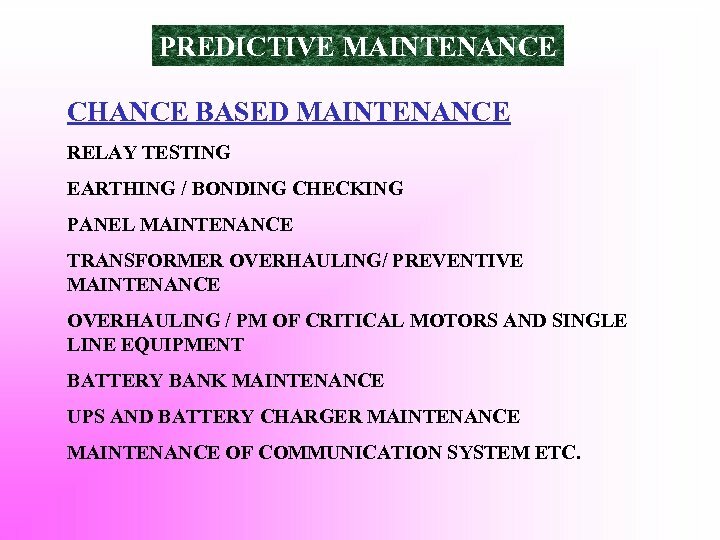 q AUTOMATICALLY PROVIDES PREDICTIVE MAINTENANCE CAPABILITIES. 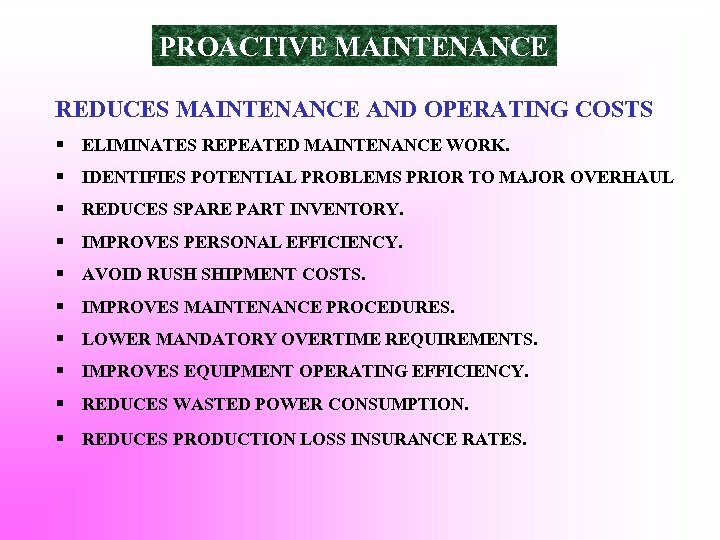 PROACTIVE MAINTENANCE REDUCES MAINTENANCE AND OPERATING COSTS § ELIMINATES REPEATED MAINTENANCE WORK. 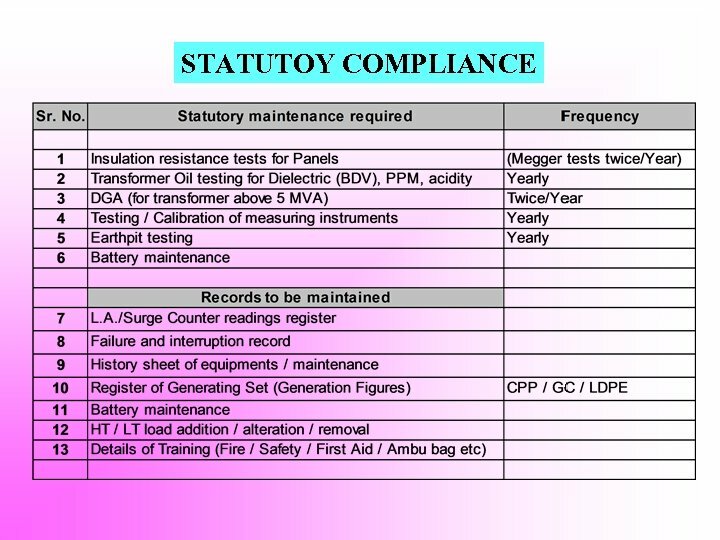 § IDENTIFIES POTENTIAL PROBLEMS PRIOR TO MAJOR OVERHAUL § REDUCES SPARE PART INVENTORY. § IMPROVES PERSONAL EFFICIENCY. § AVOID RUSH SHIPMENT COSTS. 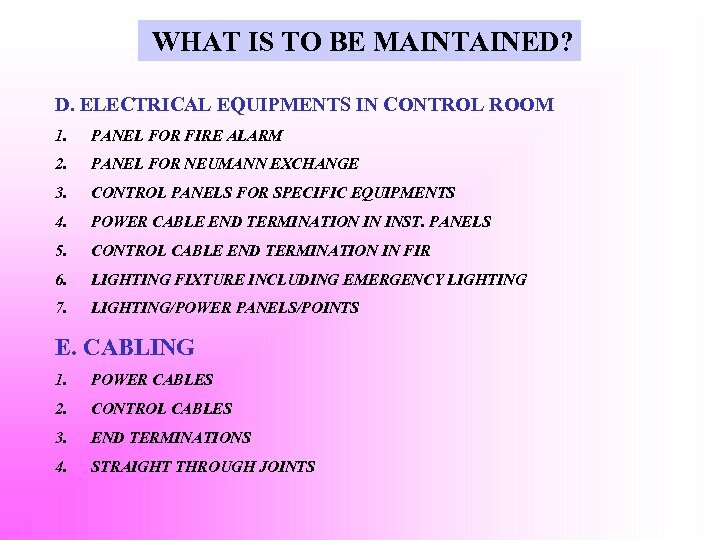 § IMPROVES MAINTENANCE PROCEDURES. 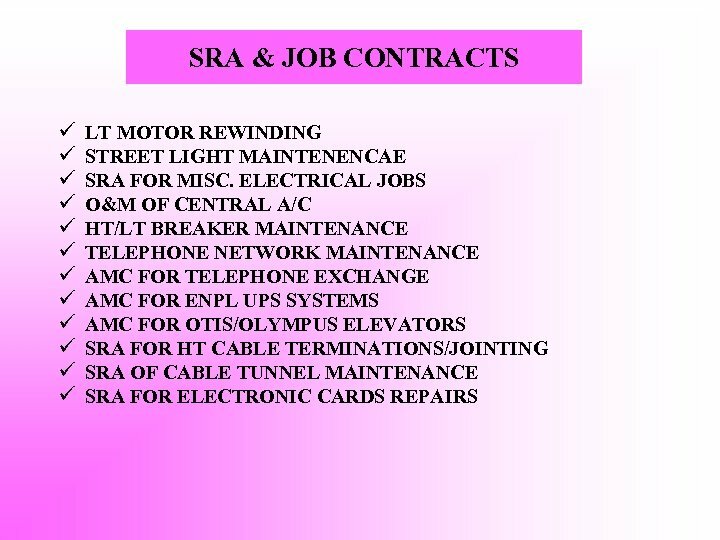 § LOWER MANDATORY OVERTIME REQUIREMENTS. 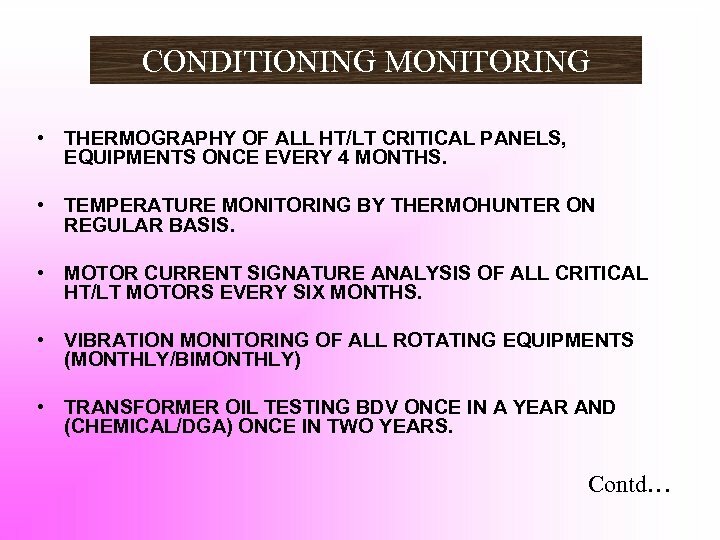 § IMPROVES EQUIPMENT OPERATING EFFICIENCY. 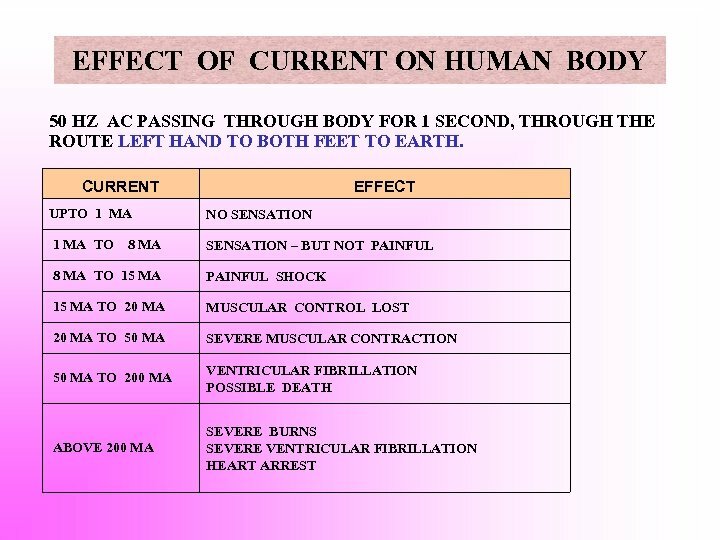 § REDUCES WASTED POWER CONSUMPTION. 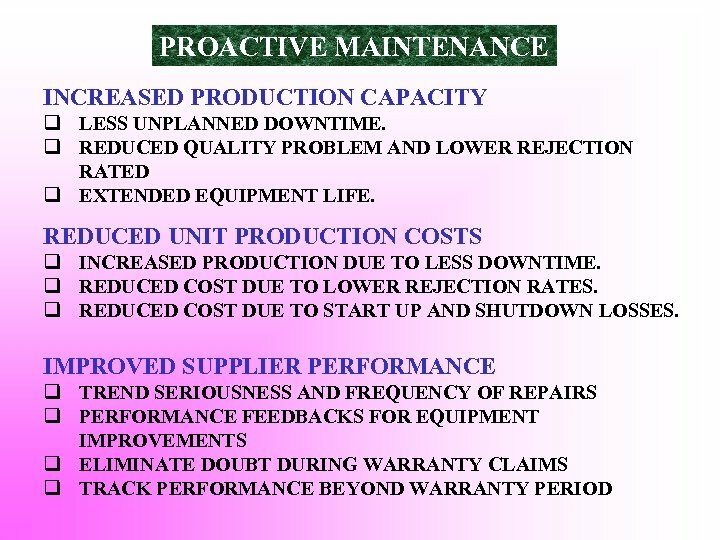 § REDUCES PRODUCTION LOSS INSURANCE RATES. 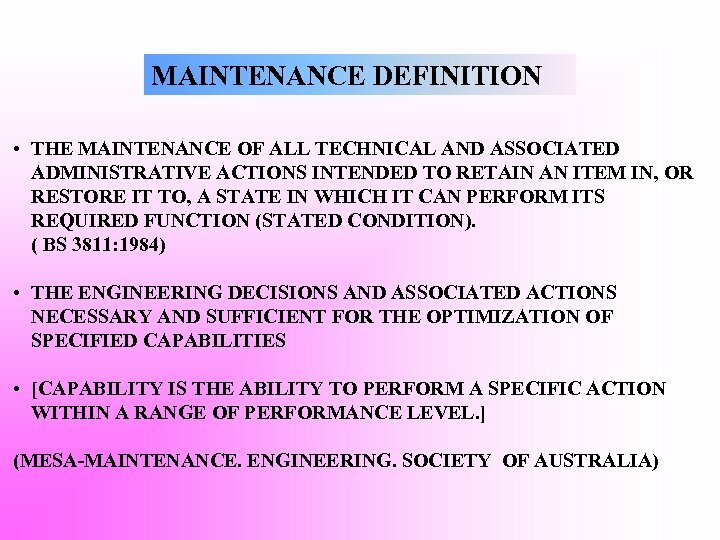 RELIABILITY CENTERED MAINTENANCE • FORM A CROSS-FUNCTIONAL TEAM TO SOLVE THE PROBLEM. 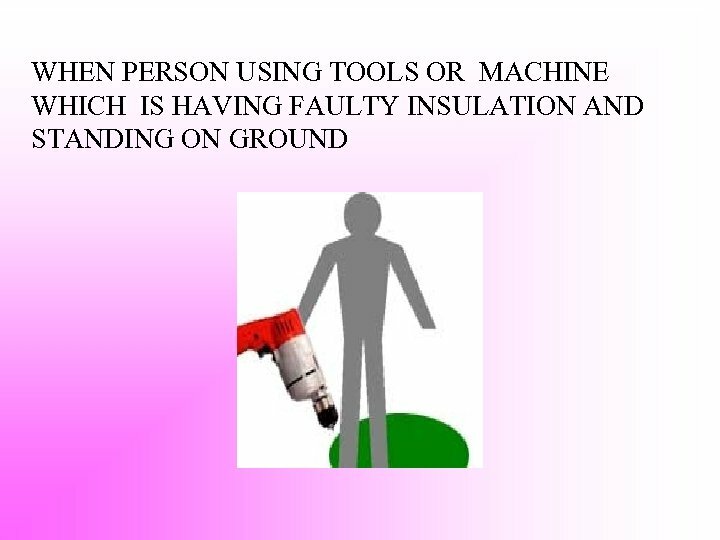 • WIDEN YOUR VIEWS TO UNDERSTAND THE CAUSE OF PROBLEM. 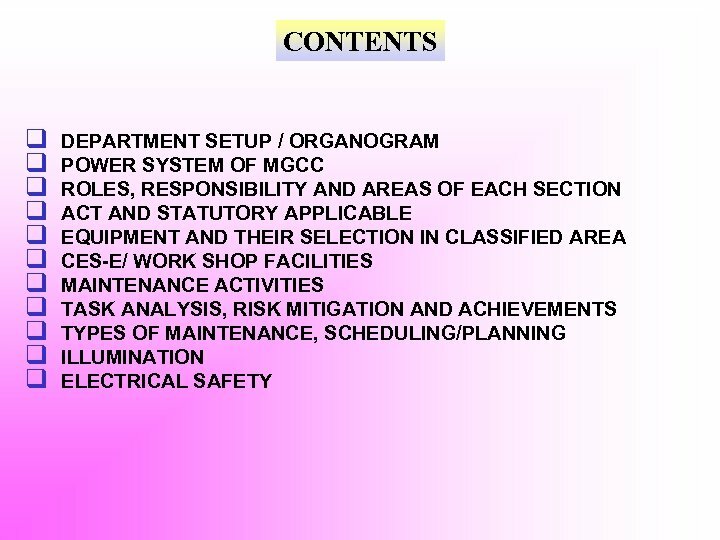 • USE BRAINSTORMING SESSION AND 5 WHY PRINCIPLES TO ARRIVE AT ROOT CAUSE.  • USE P-D-C-A CYCLE TO SOLVE THE PROBLEM. 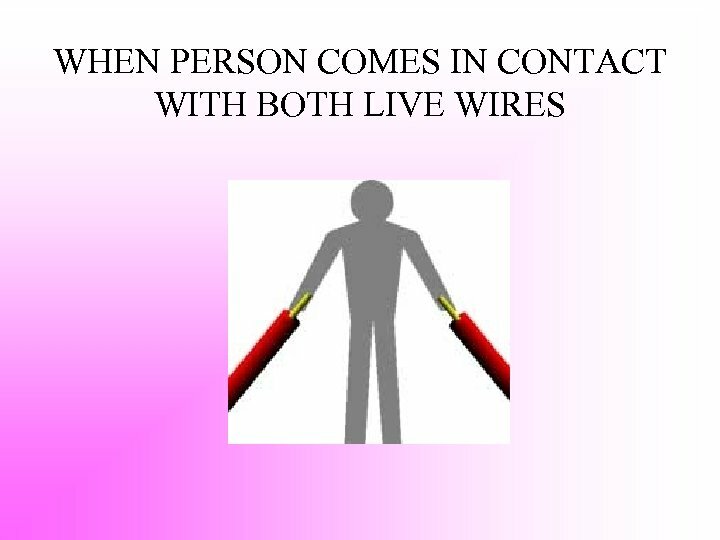 ELECTRICAL SAFETY HOW SHOCK OCCURS ELECTRICITY TRAVELS WHEN THERE IS A CLOSED CIRCUIT & ITS NORMAL ROUTE IS THROUGH A CONDUCTOR. 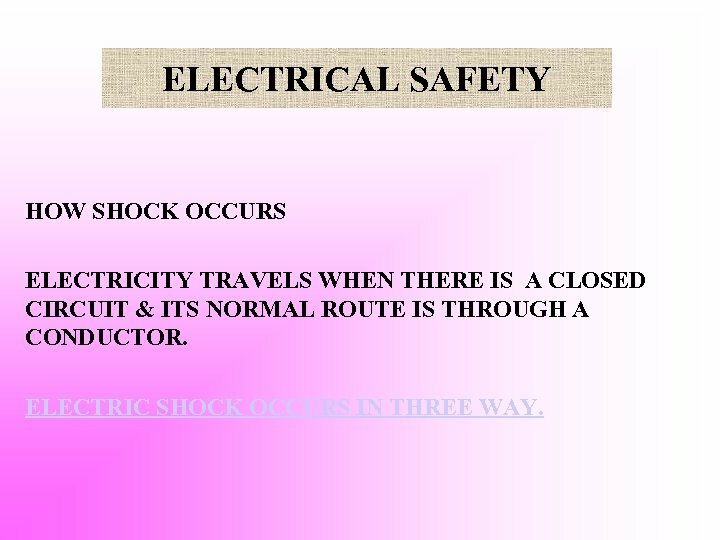 ELECTRIC SHOCK OCCURS IN THREE WAY. 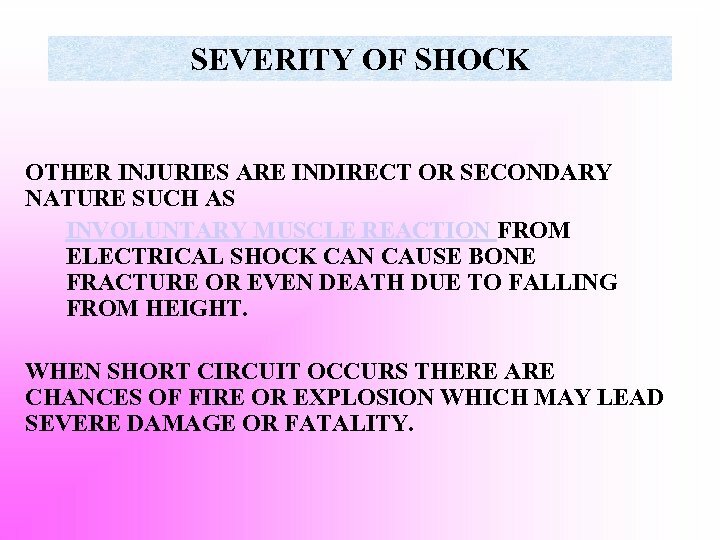 SEVERITY OF SHOCK OTHER INJURIES ARE INDIRECT OR SECONDARY NATURE SUCH AS INVOLUNTARY MUSCLE REACTION FROM ELECTRICAL SHOCK CAN CAUSE BONE FRACTURE OR EVEN DEATH DUE TO FALLING FROM HEIGHT. 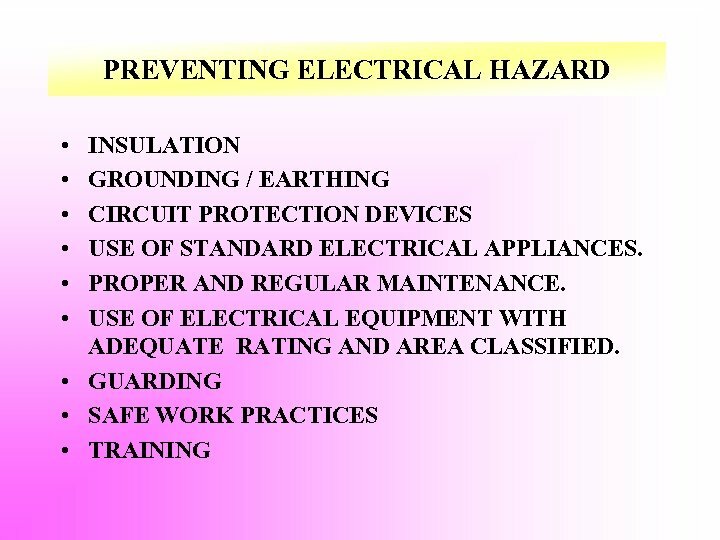 WHEN SHORT CIRCUIT OCCURS THERE ARE CHANCES OF FIRE OR EXPLOSION WHICH MAY LEAD SEVERE DAMAGE OR FATALITY.